THERE will be no council workshop this Thursday night. This month's council meeting unanimously supported a proposal by Cr Julie Triffett that the workshop scheduled for April 2 be cancelled due to it being the day before Good Friday. The council also agreed with the general manager's suggestion that this be made a permanent arrangement and that no workshops be scheduled on the Thursday night prior to Good Friday. The next workshops will be held in the New Norfolk Courthouse at 6.30pm on April 9 and 23. The format starts with an open session which the general public is invited to attend and this is for the first half hour. There are no agenda documents for council workshops. TONIGHT'S councillor workshop was advised that 66 applications had been received for the recently-advertised position of general manager of our council. Recruiting consultants KPMG will be shortlisting the applicants and interviewing 10 of them before providing the names of four candidates to be interviewed by the full council. TONIGHT'S council meeting took the first step towards seeking expressions of interest for the sensitive redevelopment of the council-owned section of the Willow Court historic site in New Norfolk. This is not to say the council is going sell what is left, or that we are giving up on the site. The first stage of the redevelopment of the Barracks precinct is almost complete, but that is only the start of what is required to turn a derelict hospital into a world-class visitor attraction. That is still my aim and the council's ambition, but with all funding now exhausted and no new money on the horizon, all options must be explored if we are to maintain the recently-established momentum. This has been the subject of discussion at councillor workshops over recent months as it has become apparent that funding requests to the State and Federal governments have been unsuccessful. In a report to tonight's council meeting held at Bushy Park, the general manager wrote: "It is now seen that council’s only option, without placing greater strain on council's operating budget, that calling for expressions of interest is now the only reasonable option for developing the site to achieve a tourism or commercial outcome for the Willow Court precinct." Last month a briefing was given to representatives of the Friends of Willow Court, Friends of Frescati and the Australian Paranormal Investigation Unit in recognition of their interest and out of respect for their ongoing interest in the site. Tonight's meeting endorsed my motion that the council seek expressions of interest for the development of the council-owned sections of Willow Court. Council workshops over the next few weeks will refine the draft terms of reference already prepared by the general manager so that they may be tabled at next month's council meeting. In calling for expressions of interest, the council has no preconceived notions or expectations other than a desire to receive submissions from individuals, groups or commercial operators to develop the site to its full potential. This could involve small-scale visitor operations, long-term leases or even the sale of the site under the right circumstances. We are not expecting anyone to come forward offering $10 million to complete the restoration in one hit, but should such a proposal be received it would have to be considered along with all others. Meanwhile, the council continues to apply for grants for Willow Court and has not stopped lobbying at State and Federal levels for government support. We have lodged our nomination for National Heritage List recognition for the site and we have established a partnership with Flinders University that will potentially see hundreds of archaeology students visiting us over the next 10 years. The latter has started in a small way this year with a successful field school conducted last month. We are not giving up on Willow Court. THE monthly council meeting for March will be held at Bushy Park this Thursday night, starting with a community forum at 6.30pm followed by the regular council meeting at 7pm. The venue will be the hall at the Bushy Park Swimming Pool and you are very welcome to join us. The community forum is an informal session with no agenda. If you would like any assistance or information about the meeting, please do get in touch. The meeting agenda is available online and in hardcopy from the council chambers. A reminder that council workshops are now held on the first, second and fourth Thursdays of each month. The next is scheduled for March 26. The format starts with an open session which the general public is invited to attend and this is for the first half hour. There are no agenda documents for council workshops. 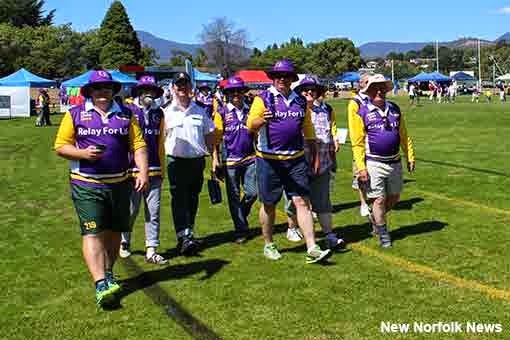 THE eight Derwent Valley councillors formed a team for the recent inaugural Relay for Life in New Norfolk, helping to add to the fundraising tally in a modest way. In the end, seven of us were able to take to the ground, with the mayor and deputy mayor putting in an incredible stint from the 2pm start until late into the night. I'd also like to acknowledge two additional members of the team - former councillors Chris Lester and Wayne Shoobridge - who put in a big effort as part of the organising team and as participants. I learned something new about Wayne when he pulled out a guitar and took to the stage as an entertainer on the Saturday night. Council was also represented by a team of staff members, the D'FAT team, and the Derwent Valley Sport and Recreation Centre. For the councillors it was a great example of teamwork and team-building, but for our community it was way to honour those who have been affected by cancer and to raise funds for cancer research. Congratulations to all 16 teams that took part, raising nearly $20,000 so far. There were some incredible personal efforts and many stories of hope and courage shared over the course of the 20-hour event. 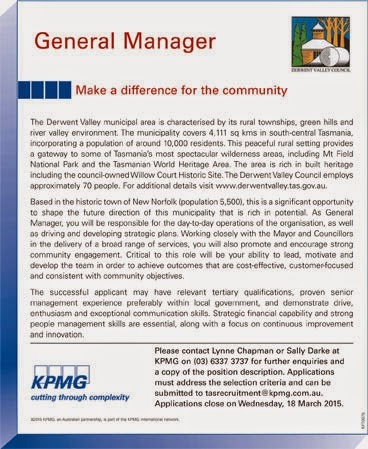 THE council has this weekend advertised the position of general manager in accordance with its decision of last December. A councillor working group met on four occasions in January and February and recommended that a consultant be engaged to assist in the recruiting process. Despite what you might have heard on the rumour mill, it is a full-time position, not part-time, and not shared with any other council. KPMG is handling the process and anyone interested in the position can contact Lynne Chapman or Sally Darke on 6337 3737. Applications close on March 18. The salary package will be in the range of $135,000 to $150,000 plus car, phone, superannuation etc, and the present general manager is eligible to apply.